The suture coated with the wax which helps in lubrication and avoids erosion of tissue. Natural material and used almost in all the department of surgical departments and in anesthesia. In anesthesia, this suture is used in fixation of the central venous catheter (CVP), Femoral catheter, dialysis catheter etc. Surgical skin stapler, 2 octyl cyanoacrylate solution etc. Silk available in dyed and undyed silk suture. Plain silk suture non-absorbable suture and braided suture. Biological/natural suture derived from the cocoon of the silkworm larva. The suture is available in different types like in gauges, sizes and in lengths etc. The suture has impinged into the stainless steel needle. Used for the approximation of soft tissue and in ligation of tissue in the abdominal surgery, cardiovascular surgery, ophthalmology surgery and in neurosurgery. The suture selected for particular patients, tissue conditions, surgical techniques, and wound sizes etc. 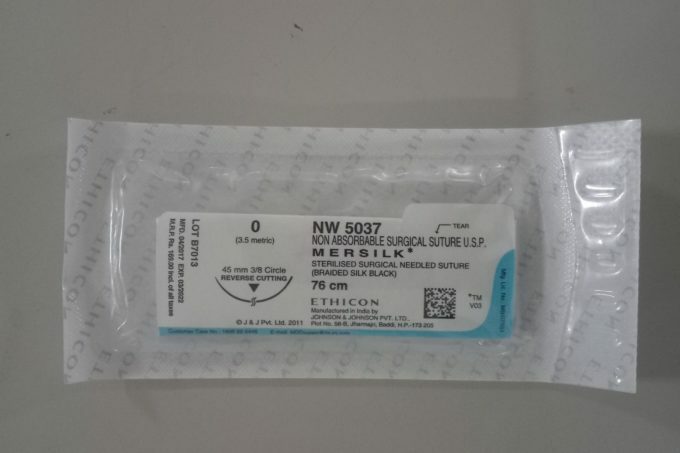 Silk suture elicits an initial inflammatory reaction in tissue and fibrous connective tissue enhance the encapsulation of suture. Keep away from the moisture, fluid and overheat.